In this guide we will configure Let’s Encrypt SSL on Apache (Ubuntu 16.04 / 17.10). You should also have Apache already installed and serving web pages before continuing with this guide. Please see Installing Apache on Ubuntu 16.04 / 17.10. Cloudflare Users: Note that you don’t need Let’s Encrypt and can instead use Cloudflare’s own shared Universal SSL certificate and an Origin CA. If you want to keep Cloudflare and also use Let’s Encrypt, you must Pause Cloudflare now, otherwise it will interfere with certificate deployment. Once the Let’s Encrypt cert is deployed, you must unpause and set SSL to Full (Strict) in the Cloudflare crypto settings, otherwise you will get a redirect loop error. UPDATE FEB 2019: This article has been updated to reflect Let’s Encrypt’s end of TLS-SNI-01 support. Let’s begin by updating the package lists and installing software-properties-common. Commands separated by && will run in succession. Now add the repositories universe and certbot. Update the package lists again and install certbot for Apache. This is the Let’s Encrypt client. Press y and ENTER when prompted to continue. We will now obtain a cert for our test domain example.com. Certbot has an Apache plugin, which automates the certificate installation. Enter an email address where you can be contacted in case of urgent renewal and security notices. Press a and ENTER to agree to the Terms of Service. Press n and ENTER to not share your email address with EFF. If you have multiple domains already configured on your server, you will see a list of them here. In this example, we only have one domain example.com and its www. prefix. Select option 1 if you don’t want to use the www. prefix in your website address, otherwise select option 2. Press 2 and ENTER to redirect all traffic to HTTPS. 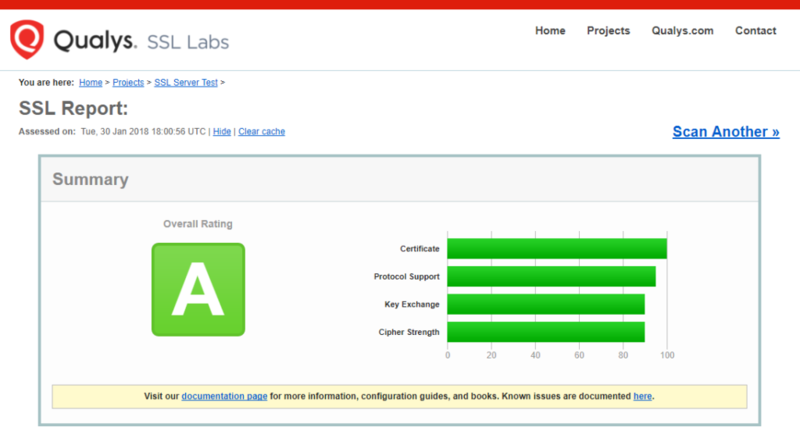 You can now go to ssllabs.com/ssltest/ and run an SSL test on your domain. A successful test should receive an A rating. As these certs expire after 90 days, we need to schedule a cron job to do it for us automatically. Edit the cron tab. We recommend selecting the nano editor if prompted. Paste in the following to the bottom of the file. The 15 3 * * * part of this line means “run the following command at 3:15 am, every day”. You may choose any time. Cron will now run every day and renew cert if needed. http://www.example.com redirected you too many times.